Gift Dr. Emanuel Nobel "to a friend"
The Nobel Ice Egg, also known as "Snowflake Egg", is made of platinum, silver, translucent white enamel, seed and seed pearls. The miniature watch is made of platinum, rose-cut diamonds and rock crystal. The Nobel Ice Egg was made for Dr. Emanuel Nobel, nephew of Alfred Nobel who founded the Nobel prize. Emanuel Nobel, one of the leading figures of the oil industry at this time, was amongst Fabergé's most important clients. Emanuel Nobel's father, Ludvig, was one of the founders of the Nobel Brothers Petroleum Production Company (Branobel) oil company in Baku, now Azerbaijan. Together the three brothers Ludvig, Robert and Alfred founded this company that was in 1917 responsible for one third of the total crude oil production in Russia. The brothers Ludvig and Robert lived both in Baku in their mansion "Villa Petroleo" and in Saint Petersburg. After the Russian Revolution, the oil company came into the hands of the Bolsheviks and the Nobel Family was forced to leave Russia and return to Stockholm, Sweden where they originated from. The family however had more oil interests in Europe which they sold in the 1920's, that way securing a future life in great wealth. The Nobel Ice Egg commissioned by Emanuel Nobel was created in platinum, silver and seed-pearls. It not only stems from the same inspiration as The 1913 Winter Egg, but also shares the same technique in the execution of the hinges within graduated borders. 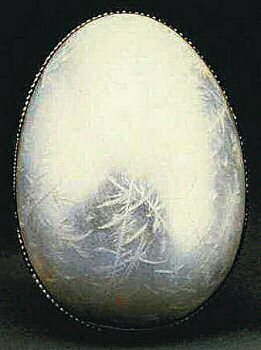 However, the Nobel Ice Egg without a stand and lying on its side, was made of translucent white enamel over engraved frost crystals and lacks some of the charm and realism of the Winter Egg. It was designed by Alma Theresia Pihl. There is a clear connection between the imperial 1913 Winter Egg and Pihl's second masterpiece, the Nobel Ice Egg which was made for Emanuel Nobel and presented by Dr. Nobel "to a friend." Its whereabouts had been unknown for many years before it resurfaced in 1994. 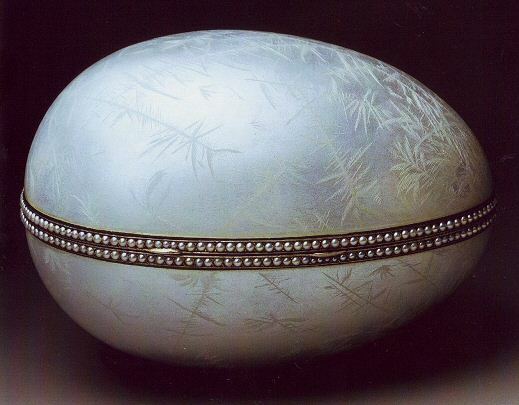 At first glance, the Ice Egg appears rather plain, but this appearance is deceptive, for the simple silver-pearl matte ground of the Eggs shell is covered with alternating layers of transparent and opaque white enamel, each layer separately painted and engraved to resemble frost. The result is an icy lustre that shimmers like a cold winter morning. Inside is a watch pendant, the dial of which is wittily half-concealed by the icy burnish given to the rock-crystal case. By the time she was 25 years old, Alma Theresia Pihl had created many designs for the renowned jeweler Peter Carl Faberge. She was the niece of Faberge's jewelry workmaster Albert Holmstrom, and because, as a friend recalled, she "wasn't much good in the kitchen," she was allowed to draw designs in her uncle's workshop. The rediscovery of two Faberge Easter Eggs and of Holmstrom's long-lost record books reveal that Pihl was a designer of singular originality. Born in 1888, Pihl was the daughter of the Finnish Faberge workmaster Knut Oskar Pihl (1860-1897) and Fanny Florentina Holmstrom (1869-1949), the daughter of the jewelry workmaster August Wilhelm Holmstrom (1829-1903). On August Holmstrom's death, his son, Albert, took over Faberge's jewelry workshops. In 1909 Alma was given the job of sketching into the record books the jewelry made in her uncle's shop. In 1911 she became a designer in the workshop, a position she kept even after her marriage in 1912 to Nikolaj Klee (1879-1960). Alma's first noteworthy assignment as a designer came from one of Faberge's most important clients, Dr. Emanuel Nobel, a member of the famous Swedish family of industrialists. Nobel, who lived and worked in Russia, was remembered by Faberge's chief designer, Francois Petrovich Birbaum, as being "so generous in his presents that at times it seemed that this was his chief occupation and delight". Henry Charles Bainbridge, the director of Faberge's London branch from 1908 to 1917, recalled that for Dr. Nobel a dinner party was no dinner at all unless all the ladies were suitably rewarded. On one of those occasions, wishing to recall a Russian winter, he conceived the idea of giving all the ladies present an icicle. 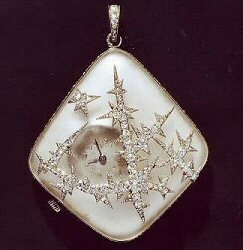 Faberge carried this out in pendants and brooches in rock-crystal with a matte surface adorned with small diamonds in frost design. Alma 's niece Lydia Pihl recalled: Alma remembered very vividly the day there was an order from the Nobel Office, very urgently to make up forty small pieces, preferably brooches, in a new design....As ice crystals were very frequent on the draughty window panes in those days, she suddenly got her inspiration from those. The success of Pihl's "frost flower" designs for Nobel is surprising on three counts: she was a designer barely out of her apprenticeship; the reputation of the firm's designers was based on their superb re-interpretations of historic styles, not on innovative designs drawn from the everyday; and ice was a rare conceit in the decorative arts, so there were few precedents from which to draw inspiration. The Nobel jewels were the first of several frost flowers designed by Pihl to commemorate the brutal Russian winter, capturing with quartz and diamonds the beautiful, cold, and fragile sparklings of ice, snow, and frost. The Faberge firm produced so many pieces based on this concept that it eventually became "very stereotyped and... a boring chore for the poor designer". Before boredom set in, however, Pihl used the theme of winter and ice for two other masterpieces. The Nobel order dates from May 1912, about the time that the Faberge firm would have been casting about for new ideas for the next year's imperial Easter Eggs, one each for Tsar Nicholas II to present to his mother and his wife. Sometime in 1912, using the Nobel designs as a prototype, she designed the 1913 Winter Egg, which was presented to the Tsar's mother. A beautiful whimsy of engraved rock crystal decorated with diamond-set platinum frost and icicles, it conceals a diamond-set platinum basket of white quartz wood anemones with jade leaves, alluding to Easter's lessons of resurrection and the promise of spring. The Nobel Ice Egg was bought by the Forbes Magazine Collection in 1998. Sold privately (between 1998 and 2004) to an anonymous buyer. Bought by Artie and Dorothy McFerrin for their collection in 2010. 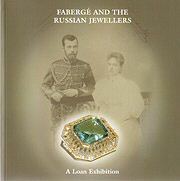 The beautiful photograph of the Nobel Ice Egg at the top of this page was published in the Wartski Catalogue at the occasion of the exposition "Fabergé and the Russian Jewellers", May 2006. Messrs Wartski gave me permission to use their picture on this page, for which I thank them wholeheartedly! The Wartski May 2006 cataloque. For the Wartski website, click here! It is now thought that the Nobel Ice Egg was a gift from Emanuel Nobel to one of his family members. How the Egg left the family however is not known. It is said that after the Russian Revolution, it was sold to the "Parisian dealer A.A. Anatra", whom subsequently sold it to Mr. Jacques Zolotnitzky, of A La Vieille Russie, in Paris etc. (See above). The A.A. Anatra however is quite interesting for this could have been banker and airoplaine builder Arthur Anatra from Odessa. Anyone having information on Mr. Anatra, please contact me!